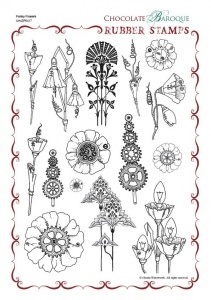 This rubber stamp set contains 15 images including steampunk stylised flowers and cogs. 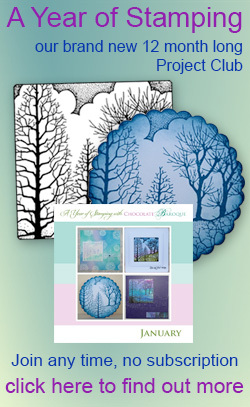 Many images are ideal for colouring with markers or your favourite pencils, whilst simple embossing will produce a classic finish. 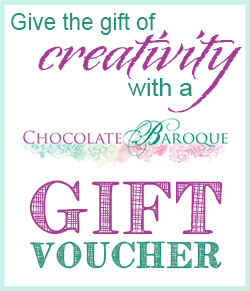 Always eager to see Chocolate Baroque new product but completely missed these beauties. Now rectified, although not used yet, I trust the quality of all CB products and I know they will stamp beautifully. The only limitation will be my imagination. "the usual" flower cards I make. I now appear to be on trend at 60! Love the designs on the sheet, a very original and versatile display of flowers which I very much look forward to using as a card making enthusiast. Nice product quality, quick delivery. The A4 sheets seem so big and expensive, especially if you only want one or two of the images. 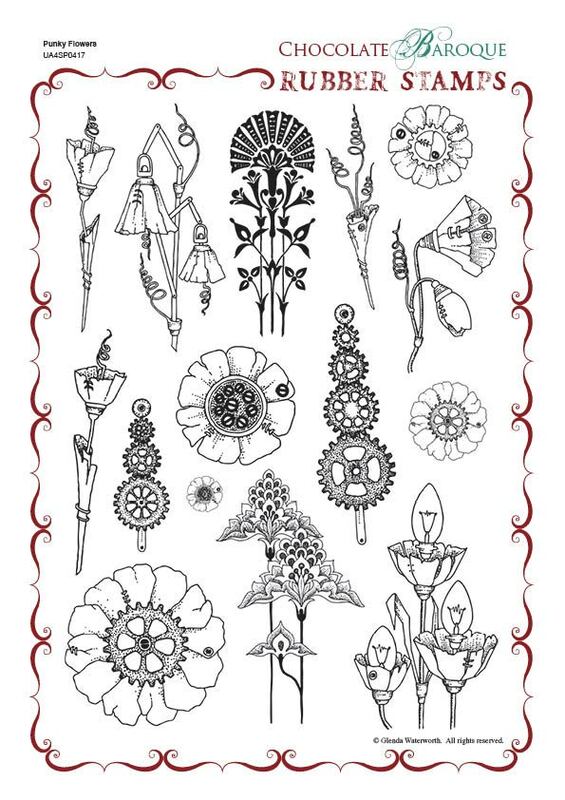 What is lovely about this sheet, is that there are a variety of styles with steam punk and art deco. As ever some high quality stamps which emboss beautifully. A delightful set of stamps with many applications!! I love this set. The more I use them the more possibilities I see. I like the mix of solid and line stamps as well. My third purchase since I discovered Glend's site and the stamps are of the same high quality as the last two purchases. Love these designs, very verstile and will have a lot of fun with them. Another amazing stamp set! I keep telling myself that I have enough stamps, but then I get one of Glenda's update emails and just can't resist. The quality of all CB stamps is excellent and this particular set is no exception. Crisp, clear images every time and I have so many ideas for using these images that my only problem will be finding the time to do them all.